If you don’t promote your blog, how will anyone know about your great content? Driving traffic to your blog is about as essential to your blogging success as your writing itself. Take the opportunity to cross promote your blog on Twitter. Tweeting about your blog can be an incredible way to reach out and connect with your consumer. With over 500 million users, you can find lots of new readers through tweeting too. If you use Twitter well, it can drive tons of traffic back to your blog. But simply tweeting the title of your blog post with a link back to your site will not work. You need to be pro-active. You need to be creative. You need to use great marketing when you are tweeting about your blog posts. Here are 12 simple, actionable tweet formulas to market your blog. Try these out to drive more traffic to your site. When you’re tweeting a link to your blog post, get creative. Try making really short tweets that invoke interest in your blog article. They work. When you’re tweeting about your article, keep in mind that you don’t need to stick with the title of your post. Check out this example from Copyblogger’sBrian Clark. In six words, and less than 55 characters, he creates a call-to-action, and makes you want find out what his article is about. The title of his article is actually “3 Modern Marketing Mistakes and How to Fix Them”. Here’s another example of a provocative tweet that links to a blog article. Mashable generates disbelief - and interest - in eight words. Try it out for yourself. Take a blog post you wrote, and write out five variations of tweet that’s 10 words or less. Tweet them to see what works best. Give your followers a taste of your blog post. Include an intriguing quote from your article. Try to find a quote that’s concise and gives a flavour of the contents of your post. Again, you don’t need to just tweet the title of your article. Show your followers a little more about what your blog post is about. Quotes in general do really well on Twitter. Studies have shown that a tweet with a quote is 54%more likely to get retweeted. If your followers like your quote, and retweet it, they are also likely to click through to your website. If you have any interesting statistical information in your article, tweet about it. And to have even more of an impact, use numbers and characters - not just letters. The numbers and characters will make your tweet stand out in the river of tweets your followers get in their timelines. Here’s an example from Hubspot. They use a short “did you know” question, and include numbers and characters to convey a pretty amazing fact from their article about display ads. They include the shortened link to the blog post after their fact. Hashtags are a great way to spread your tweets to various topics. For those who still don’t know what a hashtag is - basically, it’s a word or two behind a # that makes a common discussion subject. Hashtags have been in use on Twitter for many years, and they provide a great way to connect with twitter users beyond just your Followers. There a few methods to use hashtags when you are tweeting to drive traffic back to your blog. Here are two examples. You can use this method for your entire blog on your website, or specific events like a contest on your blog (we’ll get to this tactic shortly). Use general post related hashtags. Include hashtags with the topics about your blog. This gets your tweet seen by other Twitter users searching for the topics you’ve written about. For example, Bored Panda writes about crazy news in their posts. They connect with readers on Twitter by using hashtags of the news topics. In this case, they use #thunderstorm and #supercell for their coverage on a Texas storm. This extends their reach to all of their followers on Twitter, and to other Twitter users interested in the Texas storm. A mention is how you include Twitter users’ @usernames. They are a way you can send a tweet directly to followers, customers, or anyone on Twitter. You can use @mentions in a number of ways. If your blog post comments on prominent bloggers, companies or customers - mention them in a tweet that links back to your post. Not only will they appreciate the mention, but it might just get your tweet retweeted to their followers too. In this example, we at Wishpond wrote a blog post about Sephora, and how they create outstanding board on Pinterest. We mentioned them in our Tweet. Mention people who’ve made good comments on your blog post, too. This is a great way to thank your loyal blog readers. You can also mention the author of the blog post. Whether they are a guest blogger, a new blogger, or even a regular blogger on your site, mention them in a tweet that links back to their post. It’s a nice gesture, and will likely result in a retweet to their followers. In this example by Shauna Miller of Penny Chic, she mentions a first time blogger on her fashion blog. This example shows a tweet from @Econsultancy. They @mentioned Wishpond, and included a link to their blog on which they published our infographic on Social Media Marketing. At Wishpond, we retweeted their tweet to our infographic. This is a great way to get your blog related tweets retweeted. Simply ask your followers to retweet, or RT your update. Tweets that ask for a “RT” or “retweet” get 12 to 23 timesas many shares as those that don’t. To get more traffic to your blog, ask for a retweet when you tweet a link back to your blog post. 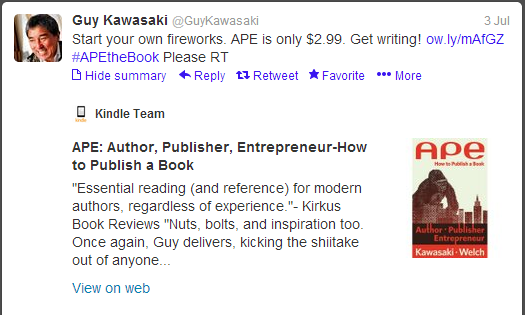 In this example, Guy Kawasaki asks his followers to “Please RT” on a tweet linking back to his blog site. 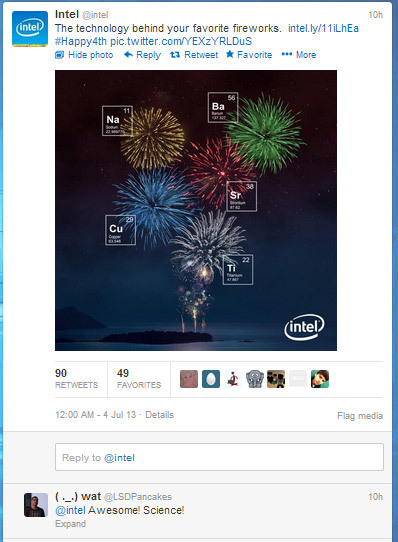 In this example, Intel tweeted a very clever image on the 4th of July. Their blog post is about the technology of fireworks. In just 10 hours, this one tweet alone had 90 retweets and 49 favourites. As you can see, the image is colorful, visually appealing and related to the science of fireworks. A question in your tweet can generate lots of engagement. If the question generates enough connection and curiosity with your followers, it will get more clicks to your blog. In this example from HootSuite, the tweet could have simply tweeted the title of their blog post. Instead, they posed a very playful question to their followers. It relates to their users by asking about browsers - not offices. It makes the reader feel ok if they tend to be on the messy side. And it can pique their followers’ interest to click through to their blog post. Try this method of update for your next blog post tweet. What question can you ask your followers to make them want to click through to your blog? Running a contest, sweepstakes or group offer on your blog is a brilliant way to drive traffic to your site. It creates engagement with your readers, and gives great incentive for new readers to visit your blog. Tweeting about your contest can drive even more traffic to your blog. Check out this example from AOL. AOL is promoting their contest, to increase their Twitter followers. They are offering a summer prize pack. To learn more about the contest, interested participants need to click through to the AOL blog. Promoted Tweets are a pretty inexpensive advertising option provided by Twitter. They can help spread your content to your target market. Instead of just showing up in your followers feeds, the tweet will show up in other users’ feeds too. You can set up your Promoted Tweets to target by geography, interests, device used, and even by keywords. By promoting tweets that contain a link to one of your blog posts, you can broadcast your tweets to Twitter users that wouldn’t normally see them. This is an effective and cool way to drive new traffic to your blog. Check out how Jeff Bullas has used Promoted Tweets to drive more traffic to his popular digital marketing blog. The icon on the left hand side shows that it is a paid tweet, but it’s quite subtle. His tweet is direct and includes numbers, making it stand out in a user’s twitter timeline. Your Twitter bio is what your followers (and others) see when they visit you on Twitter. It doesn’t change unless you make changes to it. This lends itself to being a perfect opportunity to drive more traffic to your blog. Include a link to your blog, or even a particular blog post, in your about and/ or contact sections of your bio. Both sections have clickable link capabilities. You can include CTA’s to entice your followers to click through to your blog too. For example, if you have a great post you’ve written and you’d like drive traffic to it for a few weeks, make a CTA, and include it in your bio. Express the benefits of clicking through, similar to some of the above mentioned tweets. 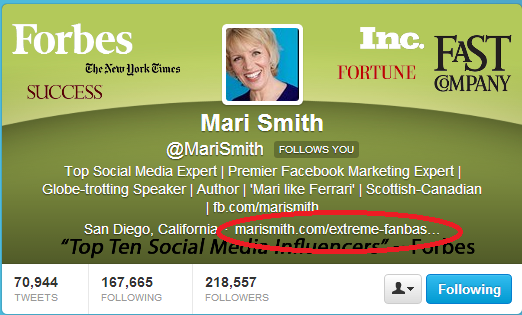 Mari Smith uses this tactic, to drive traffic to a specific landing page on her blog. This particular link cleverly brings you to a post about Mari’s new Facebook Marketing Online Course. It’s a smart way to drive more traffic to her already very popular blog. Cross-promoting your blog posts through Twitter can be greatly beneficial in driving more traffic to your blog. It also gives you a lot of engaging content to tweet about! What do you think? Have you tried any of these Twitter marketing methods? What has worked for you? What hasn’t worked so well for you?